Written by Amy Bounds, March 7, 2017. 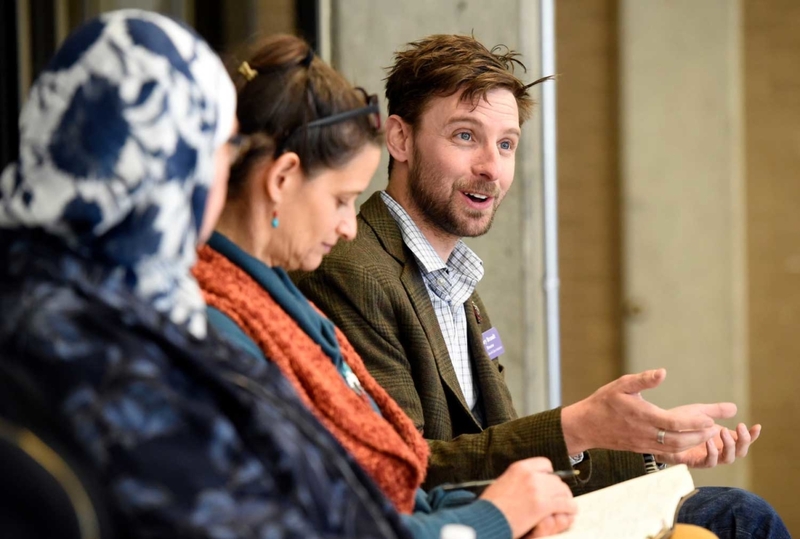 An imam from the Islamic Center of Boulder, a representative from the Boulder Jewish Community Center and a Unitarian reverend focused on their similarities while speaking at Centaurus High School on Tuesday in Lafayette. The panelists also emphasized their commitment to stand up for those who are oppressed. “Whoever’s marginalized, it’s our job to help support them,” Boulder Jewish Teen Initiative Director Gary Brandt said. The panel is part of the first-ever Centaurus Social Justice Week, the brainchild of a coalition of Centaurus clubs and groups that’s bringing in guest speakers every day after school this week. Group member Elizabeth Whiteaker, a junior, said she especially wants to make sure the school’s Latino community feels supported. “You need to start local, otherwise nothing is really going to change,” she said. Tuesday’s panelists included Boulder Valley Unitarian Universalist Fellowship Rev. Lydia Ferrante-Roseberry, Islamic Community Center Imam Shoaib Zenati and Donna, a local Muslim woman who declined to give her last name. Ferrante-Roseberry talked about how religion can bring people together and provide support. “People have this sense of religion as being divisive, as being the problem,” she said. Zenati sang several verses in Arabic, then explained their meanings, including that God will help those who try to unite their communities. He also explained Islamic extremists, using an analogy of a bad driver who crashes a car, saying it’s the driver, not that model of car, that’s the problem. Donna said she’s an American who converted after marrying her Muslim husband. She noted it was solely her choice to convert, just as it’s her choice to wear a headscarf. She said education is key to addressing the many misconceptions about her religion, adding that the vast majority of the world’s Muslims are peaceful. “The more you know about us, the more you know we’re not a threat,” she said. Centaurus junior Sabrina Stern, who introduced Tuesday’s panelists, said she started the school’s Jewish cultural club because she sometimes feels isolated. She’s also attended training through the Anti-Defamation League’s “No Place for Hate” program. The social justice week events, which run from 3:30 to 5 p.m. in the Student Center at Centaurus, continue through Friday. On Monday, Gustavo Reyna, mayor pro-tem of Lafayette, spoke about the Lafayette’s commitment to being a sanctuary city. Wednesday event, co-sponsored by the Lafayette Peer Empowerment Project and the Lafayette Youth Advisory Committee, features poet Sheree Brown talking about women’s rights. On Thursday, Nicole Garcia, a transgender Latina woman, plans to speak about her experiences. On Friday, students are planning a community art project and potluck picnic.